This is Chris making a batch of fudge. The first thing that goes into the pot is butter, which is melted. 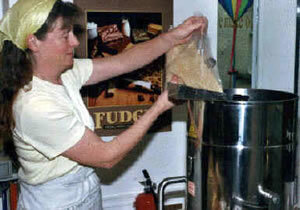 Then the fudge mix is poured into the kettle which heats the fudge evenly and stirs it slowly. Adding exactly the right amount of water is a real skill as the amount depends on several factors, including the humidity of the air. 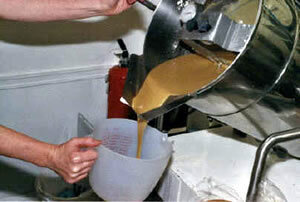 Fresh fudge mix - this is the caramel variety. One thing the pictures can't convey is the delicious smell! 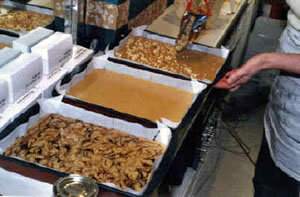 The mix is poured into trays. 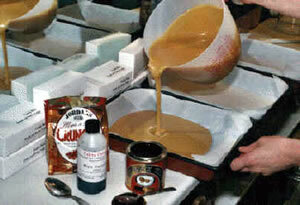 Finally, Chris adds the extra ingredients to make lots of different varieties of fudge, including the swirly ones. 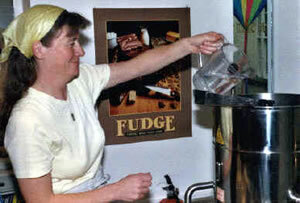 The fudge sets and is ready to serve the next day. Sugar, butter, corn syrup, partially hydrogenated vegetable oils with lecithin, skimmed milk, cream, E150 (an artificial flavouring), salt and - in the chocolate fudges - cocoa and chocolate.